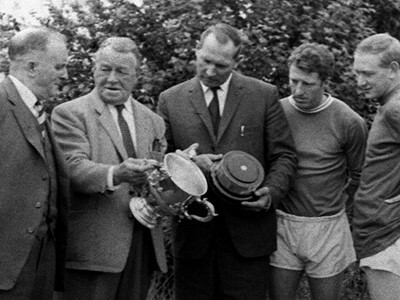 Dr E. Gregory, chairman Harry Morris, manager Gil Merrick and players Jimmy Harris and Johnny Schofield admire the 1963 League Cup trophy. 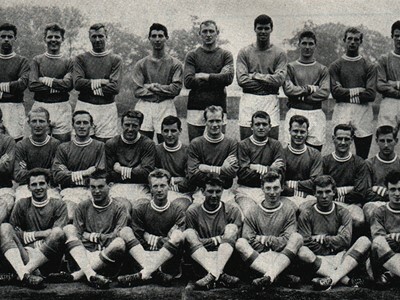 On Monday 27 May, 1963 Blues lifted their first major trophy by beating Aston Villa in the League Cup final. It would be almost half a century before success of that magnitude would be repeated. A crowd of almost 32,000 - the third highest St. Andrew’s attendance of the season - crammed into the stadium on a Thursday night in late May for the first leg of the final. The competition, now into its third year, finally took on a whole new appeal to the silverware-starved Bluenoses. In four days time one of the captains would be lifting a shiny cup aloft, with the added ingredient of local bragging rights also up for grabs. The shackles of a relegation scrap now removed, it was the home side that set about the challenge with vigour and no little panache. Unsurprisingly, Merrick named the same side that pulled off the final-day rescue act against Leicester but they looked anything but a team that had only narrowly avoided relegation. Meanwhile, Villa, who had won the first ever League Cup tournament two years earlier, were found lacking in quality on the big stage. The visitors were up for the fight though, a little overly so during the opening exchanges. Scottish striker Bobby Thomson didn’t endear himself to the home fans as he slid in on Blues keeper Johnny Schofield. And Wales international wing-half Vic Crowe brought fellow countryman Ken Leek crashing to the ground with another wince-inducing tackle. But when it came to the cultured side of the game, it was Blues that produced all the best moves. Harris was unlucky to see his shot turned onto the crossbar by an inspired Nigel Sims between the posts for Villa. But the fans didn’t have to wait long to see the opponent’s net ripple for the first time. On 14 minutes, Harris fed the ball out to Bertie Auld on the left wing and the Scot’s pinpoint cross was clinically converted by Leek. Bloomfield became the next victim of Villa’s overly-physical approach as he was forced to leave the action to have his thigh bandaged but Mercer’s side were unable to take advantage of their numerical advantage. The visitors relied too much on lumping high balls into the Blues area, a tactic that played right into the hands of the hosts who could call on the commanding figure of skipper Trevor Smith to repel such unimaginative forays. However, the first time that Villa launched an attack on the ground four minutes before the interval they drew level. Gordon Lee and then Harry Burrows advanced with the ball before teeing up Thomson, who let fly with an instinctive effort that caught Schofield unawares and nestled into the corner. Blues were unfortunate to find themselves on level terms but in the second-half the hosts made their superiority count. Just seven minutes after the restart Harris, Auld and Leek combined again to terrific effect. The latter was put through on and he kept his composure with a cool finish beyond Sims for his second goal of the game. With so much at stage, tempers began to flare on both sides. Crowe felt the full force of Auld’s flailing elbow, Charlie Aitken shoved Blues winger Mike Hellawell in the chest before John Fraser and Harris squared up to each other and had to be dragged apart by team-mates. But whilst Merrick’s men were getting embroiled in the unpleasantries, when it came to free-flowing football they were the undoubted masters of the show and carved out a crucial third goal on 66 minutes. Harris slid the ball through to Bloomfield who weaved his magic. He tiptoed past two Villa defenders as if they weren’t there before brushing aside a challenge from Sims and pushing the ball neatly through the narrow gap between the goalkeeper and his near-post. But overall it was a thoroughly satisfying night’s work from Merrick’s men and set them up nicely for the return leg at Villa Park the following Monday. It was a script that even the Roy of the Rovers comic strip writers might have felt was a little far-fetched. Blues had gone 74 years without any major trophy to show for their endeavours, despite spending 36 seasons in the top flight of English football and regularly playing in front of bumper crowds of 30,000-plus. That long wait for silverware was potentially about to end as Gil Merrick’s men went into the second leg of the 1963 League Cup final with a healthy two-goal advantage from the first match at home. 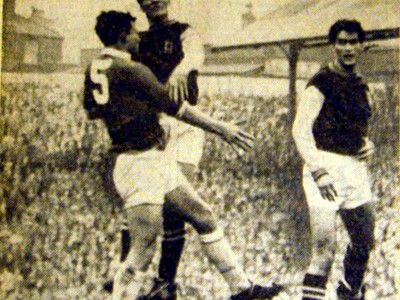 But standing in the way of that first ever triumph was the small matter of near-neighbours and arch-rivals Aston Villa. 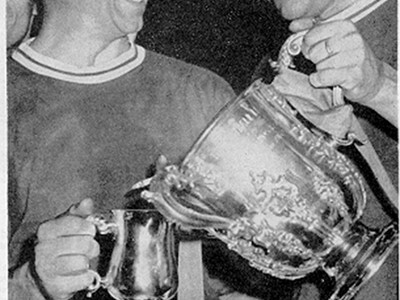 If Blues could hold their nerve then skipper Trevor Smith would not only have the honour of lifting the club’s first cup but he’d be doing so on enemy soil. Blues had gone into the first meeting of the sides in buoyant mood following their final-day escape from relegation. Unburdened from the intense pressure that had enveloped the squad during the closing weeks of the league season, Merrick’s side produced some terrific free-flowing football to take total control of the St. Andrew’s encounter and rack up a 3-1 lead. Top scorer Ken Leek’s brace was added to by a goal from Jimmy Bloomfield, with only a strike from future Blues striker Bobby Thomson for Villa putting a slight dampener on proceedings. In truth the hosts deserved to win by more than two goals and the only question was whether they would live to regret that failure to make the most of their dominance. Memories of their last visit to B6 could have cast seeds of doubt in the minds of Merrick’s players ahead of the second leg. 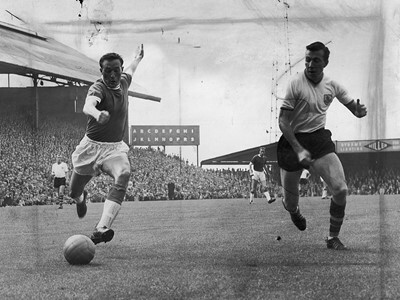 Two months earlier Joe Mercer’s team had recorded a 4-0 home league victory over a Blues side that were on a bad run of form and bereft of confidence. But this newly-invigorated Birmingham would prove a very different proposition. It was virtually the same group of players that ran out onto the Villa Park pitch from the ones which lost so heavily on their previous trip across the city. Jimmy Bloomfield was the only change to that side, although the inside-right almost missed out again. The former Arsenal man sustained bruising to his thigh during the hard-fought first leg and he was only passed fit for the rematch just 30 minutes before kick-off, with the injured leg heavily strapped to enable him to take part. It was decision that Merrick later admitted was “a gamble - that paid off”. 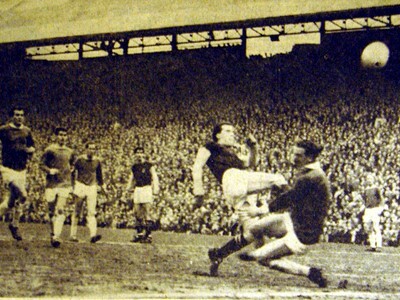 Six of the Villa side had experienced a League Cup final before, when coincidentally they had bounced back from a two-goal first leg deficit to beat Rotherham United by three goals at Villa Park to become the inaugural winners of the competition. There never looked to be any danger of a repeat recovery mission this time around. 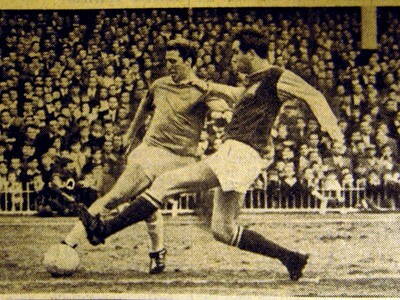 There was one other member of that victorious Villa side from 1961 that took to the turf again, but by now full-back Stan Lynn was an integral member of the Blues team. It was to be a happy homecoming for the former Villa stalwart as he enjoyed a particularly good game, as did his defensive colleagues. It was Smith that took most of the plaudits as he negated the threat of Villa’s most dangerous attacker Thomson. 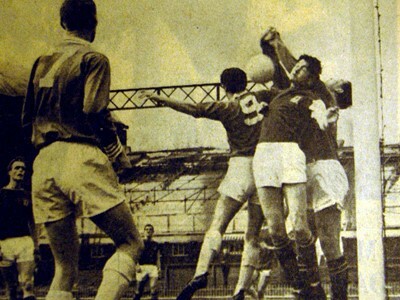 The home side’s 22-goal top scorer Harry Burrows was also kept well and truly out of harm’s way due to the close attentions of former team-mate Lynn. It was the visitors that actually came closest to opening the scoring during the first period when Jimmy Harris scooped his shot over the bar from Mike Hellawell’s cross. Villa enjoyed plenty of possession but lacked the imagination and creativity to unlock the determined and steadfast Blues backline. Mercer’s stubbornness in leaving Northern Ireland international striker Derek Dougan out in the cold following a fall-out between the pair played right into Blues’ hands. It robbed Villa of any real aerial menace and allowed Blues’ captain fantastic Smith to easily soak up everything that the hosts had to offer in terms of an attacking thrust. Experienced wing-half Vic Crowe tried his best to pep up his shot-shy side and went close with one drive as well missing the target from another opportunity. But visiting goalkeeper Johnny Schofield wasn’t truly tested during the whole 90 minutes and Merrick’s charges comfortably saw out the game to clinch a 3-1 aggregate success. Blues may have employed a few time-wasting tactics, which included prolonged bouncing of the ball inside the penalty area by Schofield in an era when pass-backs to the keeper were permitted and there was no such thing as the six-second rule, but the team certainly didn’t go there intent on holding on to what they’d got.